Nashville Katz is about to be the main course of her own Early Bird Special! Has deli owner and former New Yorker Gwen "Nashville" Katz bitten off more than she can chew? 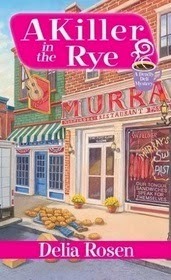 The spunky owner of Murray's Pastrami Swami finds the McCoy's Bakery delivery guy dead right in front of her deli, and his employers want to settle someone's corned beef hash. With the pregnant wife of the expired driver due any minute and her policeman brother turning up the heat, Gwen's in quite a pickle--she's a prime suspect and is about to face a griddling hot enough to sizzle a Hebrew National Frankfurter. Clearing her name and finding the killer won't be easy. Is it a newspaper editor with an off-the-record grudge? A dirty cop? Maybe a vegan with a serious beef? Between juggling two romances and making salami sandwiches, Gwen barely has time to dig for clues. But when she uncovers an un-kosher Katz family secret, she knows it's now. . .or never! Because the ties that bind. . .can also strangle!